Samosa Bowl | What Smells So Good? I love a good samosa. Growing up, one of the teachers in my school (which is still, ironically, my school now that I work there!) would make hundreds of her signature fried parcels for almost every after-school event. On International Day, when each teacher (and a good amount of parents) would bring a dish to share as a fundraiser for the school, you can bet that my tickets (and my samosa-loving dad's too) would be almost entirely dedicated to her all-vegetarian stall. I've never dared make "proper" samosas before - the pastry seemed too finicky for me to handle properly and then there was the whole "deep fry" thing that I'm scared of. But those cravings can be strong suckers and I found myself jonesing for the richly spiced filling of the snacks I loved years ago. Then it hit me - why not make a "samosa bowl"? Going with the same vein of "burrito bowls" and deconstructed sushi, I could just make the filling, sans frying, and have all the goodness I wanted for myself! 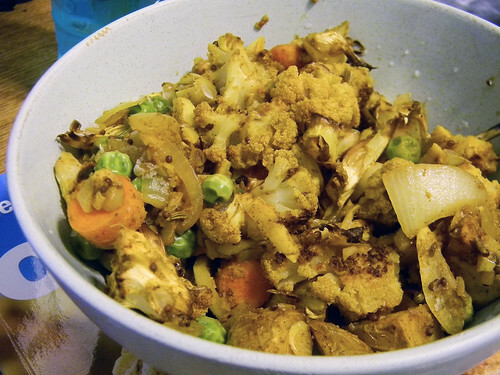 I did some Googling and cobbled together a few filling recipes to find one that suited my tastes - lots of roasted cauliflower, the requisite potatoes and peas, garlic and a vast masala of spices made their way into batch number 1, which I gobbled down for dinner. To round out the bowl a bit more, I started adding other diced veggies (like the carrots you can see in the photo below) and crumbled tofu. Once everything cooked together into a lovely golden hue I knew I had my answer - crispy bits of vegetable with sweet peas and a touch of lemony zip. A single serving of crave-busting flavour! Preheat the oven to 400F. Spread the cauliflower and potato on a baking sheet, sprinkle with salt and roast for 20 minutes, until cooked through. Meanwhile, in large skillet sprayed with cooking spray or spritz oil, fry fennel seed, cumin, cinnamon, mustard seeds, turmeric, coriander, fenugreek and cayenne 1 minute. Add onion, garlic, ginger and salt; fry until softened, about 3 minutes. Stir in potato mixture and peas. Stir in lemon juice and serve.